Our approach to wedding photography is relaxed, informal and creative. Like our portraiture and commercial work we favour the use of natural and available light. We also know how stressful organsing a wedding so we spend time with you and at the venue in the run up to the big day to make sure we understand exactly how events are going to pan out. Our style is natural and informal - we prefer the stay in the background while your day unfolds. We love to capture the moments of your day as they happen - from getting ready to your first dance. We also pay attention to all the small details that we know you will have spent a great of time and thought organising - from cupcakes to favours! Our packages start at just £350 for a small week day wedding while our main weekend weddings start at £795. 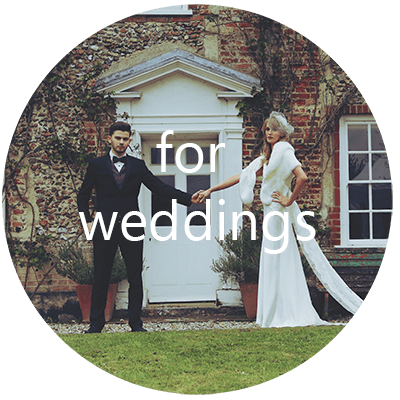 All our main packages include unlimited photos taken at your wedding, an online password protected viewing gallery and a special softback magazine style preview book containing all of the images taken. A Norfolk country cottage garden wedding!